Rediff.com » Getahead » Ooops! Did this model forget to wear her top? Ooops! Did this model forget to wear her top? The Berlin Fashion Week threw up some unusual style trends. 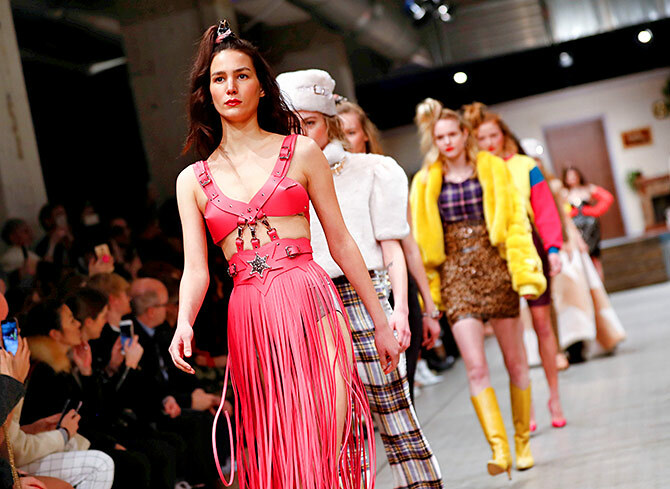 Berlin-based Australian designer Marina Hoermanseder's collection, inspired by the 80s and the 90s, made people rethink the trends that will rule this year. Presenting glimpses from her show. The bandage dress? Or the belt dress? Wonder how the model slid her bod into this outfit! This could easily be the new Catwoman suit! Agree? The designer didn't hesitate to showcase some funky designs in vibrant colours. That's a wrap! Marina Hoermanseder is escorted onstage by a model with skates. Malaika, Shilpa or Sara: Whose style is better?